In a recent note to clients, a Credit Suisse research team led by Jan Stuart shared a map showing the transport differentials for oil across the US. The grey routes represent rail transport and the light blue routes represent pipeline transport across the states. Meanwhile, the yellow, red, and dark teal represent transport by ship — with the colour indicating the destination. 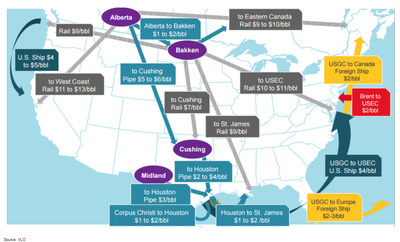 Notably, it’s way more expensive to transport oil by rail than by pipeline.